A new report from VoiceLabs examines the burgeoning market of voice-activated personal assistants. With the pushes by so many tech companies – such as Amazon, Google, and Sonos – into this space, what are device owners actually using them for? VoiceLabs’ used its Voice Experience Analytics service to give some answers to that question. 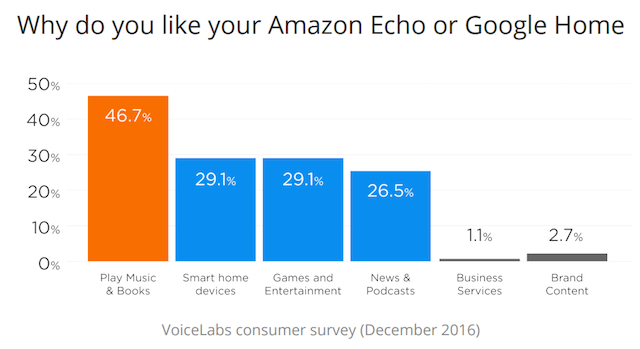 When asked “Why do you like your Amazon Echo or Google Home?”, 46.7% of respondents said it was the ability to listen to music or books. This was by far the most common reason. With 26.5% giving access to news and podcasts as driving their enjoyment, the survey results reinforce the idea of these devices as multimedia hubs. VoiceLabs projected rapid uptake of voice-first devices. It estimates that 24.5 million will ship this year for a total market footprint of about 33 million devices in circulation. But just getting the product into homes doesn’t seem to be the final step. Retention is proving to be a challenge for many voice applications. After acquiring a user, voice applications have just a 3% chance of that individual becoming active in the second week. This could be a symptom of the product class still being new and not slotting into a person’s home routines in obvious ways. Improvements to both hardware and software could better those rates. As RAIN News’ Brad Hill discovered from his first foray into using an Amazon Echo Dot, even the most established system is not flawless yet, even for its much-lauded audio resources. This will be a product category to watch, both for new technological developments and in how music providers choose to work with them.